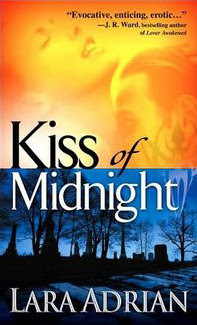 Kiss of Midnight is the first book in the Midnight Breed series by Lara Adrian. It establishes the foundation for the series and introduces us to the leader of the breed warriors, Lucan Thorne. As leader of the warriors, Lucan’s job is to protect the breed from rogue vampires and others who threaten the secrecy of their existence. Lucan and his otherworldly kin, all male, and whose ancestors first arrived on our planet as voracious, feral, bloodthirsty aliens looking for a new world after theirs was destroyed, have bred with and lived amongst the human population for centuries. But it takes a special kind of human woman to breed with these otherworldly creatures—a woman with a unique birthmark, indicating her viability as a breedmate. In Kiss of Midnight, we meet Gabrielle Maxwell, a photographer who has just received some recognition for her photographs. Gabrielle is drawn to architecture and has compiled a portfolio of unique buildings throughout the city. She will stop at nothing to get the right photo, even if it means trespassing on the property of condemned buildings and waking up before dawn to capture the perfect lighting. Unbeknownst to Gabrielle, the architectural subject matter to which she is drawn holds special meaning, not just to Gabrielle but also to the breed warriors, as these buildings are a gateway to another world that Gabrielle is about to enter. Interested in her motives, Lucan stalks Gabrielle and learns that she has no idea the dangers that lie ahead. Further, Lucan is drawn to Gabrielle. What is it with this human woman that is compelling him to get closer to her? As Lucan plots to get near her, the dangers close in, threatening Gabrielle and the breed to which Lucan has vowed to protect. This book is action packed with plenty of excitement as we enter the world of these fearsome breed warriors. Lucan is gorgeous and loyal, but also unpredictable. Gabrielle’s character is likeable and relatable. This book is full of seduction, beauty, danger, and all the qualities we expect and hope to find in a paranormal romance book. A fantastic book, and a great introduction to the other characters we will get to know better as the series continues. A must read!